Throughout the school year, many children rely on school meal programs to keep hunger at bay. Due to food scarcity in the home, these meals may be the only substantial nutrition some of these kids receive each day. However, when summer break arrives, many of these child nutrition programs end and kids are left hungry. This is when they require community assistance to fill the gap. Here are ways that communities can get healthy summer meals to children in need. Summer should be a time of rest and fun. It should also be a time for kids to develop in healthy ways so that they can learn things quickly when the new school year begins. Children living in poverty are at a disadvantage in summer because they no longer have access to the meals they normally get in school. Hunger leads to increased illnesses and delayed development, which puts these children behind their peers when school starts again. If you wonder what can be done about this, you aren’t alone. Many people are unaware of government resources that are available for providing free summer meals to kids. One of the biggest programs is the USDA’s Summer Food Service Program, which provides reimbursement for organizations offering summer meal programsfor eligible children. 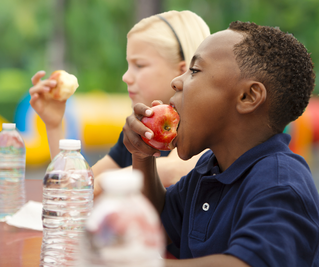 If you want to mobilize a new summer food service for hungry kids in your area, your first step should be to look over the USDA’s programguidelines and contact them for assistance.